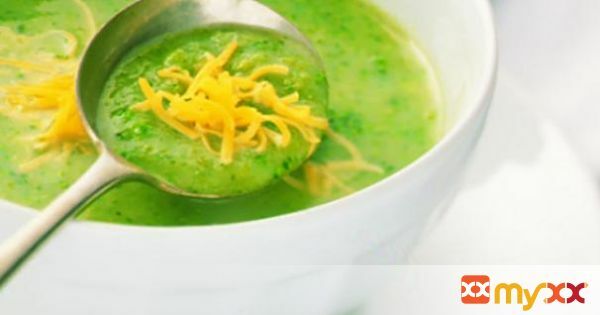 As the weather gets cooler, there is no better time for comfort food, such as this calcium-rich Broccoli Soup with Cheddar Cheese. 1. Peel and chop broccoli stems; coarsely chop florets to make at least 6 cups (1.5 L) total. 2. In saucepan, combine broccoli stems, onion, potatoes, garlic, broth, orange rind, thyme, pepper and red pepper flakes; bring to boil. 3. Reduce heat, cover and simmer for 10 min. Add florets; simmer, covered, for 5 min or until vegetables are softened. 4. In blender or food processor, purée soup, in batches, with milk until smooth. Return to pan and heat through but do not boil. Add more milk if too thick. 5. Season with salt. Spoon into bowls; sprinkle with Cheddar cheese. 6. For more information and recipes, go to Getenough.ca.